Our Mission at Food Bank of the Rockies is to end hunger by efficiently procuring and distributing food and essentials to the hungry, through our programs and partner agencies. 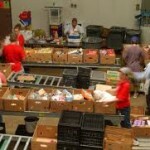 Food Bank of the Rockies (FBR) is the largest private hunger-relief organization in the state of Colorado. Founded in 1978, FBR was known as the Colorado Food Clearing House. Operating from a 900-square-foot schoolroom in Northwest Denver, the fledgling organization collected bread from a nearby Safeway store, our first food donor, and distributed it to Little Sisters of the Poor, our first partner agency. Today, FBR has extended its reach across Northern Colorado, providing food and supplies to more than 1000 hunger-relief programs. Since 1978, FBR has provided nearly 472 million pounds of food to our member agencies, which translates to 369 million meals for people in need. Last year, we distributed 41.3 million pounds of food, enough to provide 88,000 meals each day to children, seniors and families in need. FBR is a member of Feeding America. We run an efficient organization, using only 4 cents of every dollar for administration. 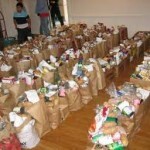 96 cents of every dollar contributed goes towards food distribution. And every dollar we receive provides four meals for our hungry neighbors. Your generous donation can provide hope to hungry men, women and children in our community!